Atlanta, GA, February 7, 2018: It was a glowing celebration of India’s growth and deepening India-US relations. The 69th Republic Day reception hosted by the Consulate General of India in Atlanta at the Westin Atlanta Perimeter North on January 28 saw special guests Lt. Governor Casey Cagle, Congressman Rob Woodall (GA-7) and Sandy Springs Mayor Rusty Paul delivering paeans to US-India partnership and mingling with a banquet hall full of representatives of Indian-American associations. “What excites me about tonight is that we can look back at the foundation laid that has given us the opportunity to be where we are today,” he added. Reflecting on his own childhood- a single mother who worked two jobs to raise him, but never took public assistance; the sacrifices she made and the importance of perseverance she instilled in him- Lt Governor Cagle said each of us is born with a certain work ethic that defines who we become, and India is a great example of that. L to R: Consul General Nagesh Singh, Lt. Gov. Casey Cagle, Congressman Rob Woodall and Sandy Springs Mayor Rusty Paul. Photos by Bytegraph. Congressman Woodall said he has received the same open heart and outstretched hands from Consul General Singh every day of his service. He hoped Prime Minister Modi would extend the Consul General’s assignment in the Southeast USA. He said, the Constitution of India is a reflection of the ethos of its ancient civilization. Despite its size, a population of over 1.3 billion people and its diversity- eight major religions, 23 national languages, every race calling India home- and seemingly insurmountable challenges that it faced during independence, the country has been steadily moved ahead. “According to McKinsey, by 2025 we will be the third largest economy in real terms and by 2050 India will be the second largest economy in the world,” he added. Citing statistics, the Consul General said 200,000 Indian students study in the US, contributing $6 million in tuition fee. About 1 million Indians travel to the US every year. Bragging about the success of the community, he said 77% Indian-Americans above the age of 25 have at least a bachelor’s degree, while the national average is about 31%. Around 44% have at least a Master’s or PhD or equivalent medical or engineering degree, while the national average is 11%. The median income for the household is 107K while the national average is in 50K range. “I also pay tribute to the great country that has housed this community. I don’t think this would be possible in any other country. Every day, I hear stories of my countrymen who came with $50 or $100 in their pocket. It is the greatness of this country that it gave them the opportunity, irrespective of their faith or color, to work hard and reach the heights of success,” he said. Borrowing from Secretary of State Rex Tillerson’s remarks on “Defining Our Relationship With India for the Next Century”, he said India and the United States are “two bookends of stability”. A strong India-US partnership is in the best interest not only of the two countries, but the rest of the world, he concluded. Former CNN anchor and Saris to Suits founder Patti Tripathi emceed the evening’s proceedings. Sitar master Kakali Bandyopadhyay, who studied with the legendary Ravi Shankar and Ali Akbar Khan, and table maestro Anjaneya Sastry, a disciple of Pandit Prithwiraj Bhattacharjee fascinated the audience with their soulful recital. 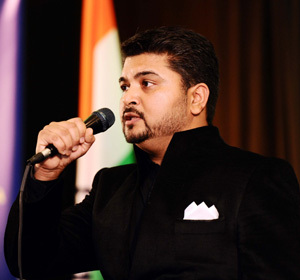 John MacDonal added the Bollywood touch to the evening with his melodious rendition of hit Hindi film songs. 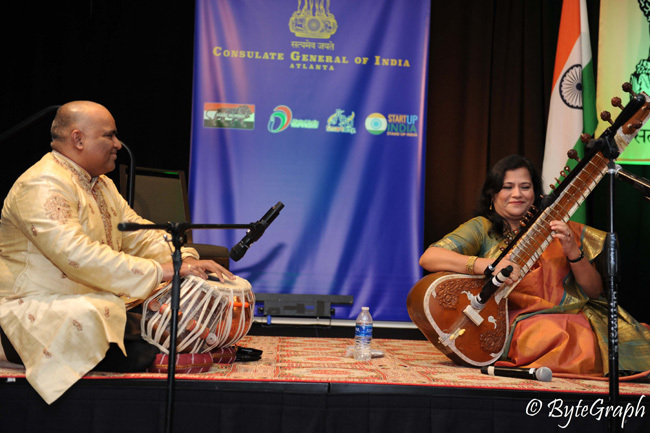 Sitarist Kakali Bandyopadhyay (R), and table maestro Anjaneya Sastry.